Born in wales in 1478, Stafford was the son of Henry Stafford, 2nd Duke of Buckingham, and his wife Catherine Woodville, a sister-in-law of Edward IV. His father was attainted and executed for rebelling against King Richard III of England when Stafford was five. When Henry VII ascended the throne, the attainder was reversed and the wardship of the young Duke and his brother Henry was given to the King's mother Margaret, Countess of Richmond. As a young man, trained as a soldier, Buckingham became a Knight of Bath in 1485 and Knight of the Garter in 1495. Served against the cornish rebellion in 1497 and had various ceremonial roles at the royal court. This continued in an even grander way with the accession of Henry VIII: Stafford became Lord High Constable, Lord High Steward, and a privy councilor, and was lord high steward at Henry's coronation in 1509, where he also carried the King's crown. BEF 1500 he married Eleanor, eldest daughter of Henry Percy, fourth Earl of Northumberland. They had one son, Henry Stafford, 1st Baron Stafford and three daughters, Elizabeth, Duchess of Norfolk; Catherine, Countess of Westmoreland and Mary, Baroness Abergavenny. He had also a daughter, Margaret, by his mistress Margaret Geddynge. In 1509, he was made a Lord High Constable. By 1510, Elizabeth Stafford, Lady Fitzwalter, informed her brother Buckingham that the younger sister Anne had attracted the attention of King Henry VIII. Her behavior was bringing shame on the Stafford family. Buckingham subsequently caught Sir William Compton in Anne’s chamber. After a heated exchange during which Buckingham is reported to have told the pair that 'women of the Stafford family are no game for Comptons, no, nor for Tudors, either', the Duke saw to it that Anne’s husband spirited his wife away from court. Henry ordered Catalina to dismiss Elizabeth for her meddling; and bawled out Buckingham, who withdrew from court in a huff. In 1513, he was a Captain in the English Army fighting in France. In 1518, his son and heir Henry, married lady Ursula Pole, daughter of Margaret Plantagenet, Countess of Salisbury. Buckingham had sought and received the King's blessing for the match, but it represented a potential danger: both Staffords and the Poles had a royal descent and a possible claim to the throne. Now the two claims were fused. In 1520, he accompanied the King to the meeting with Francois I at the Field of Cloth of Gold and to the meetings with Emperor Carlos V that preceded and followed that event. Despite his high status and royal bloodlines, Buckingham was not a courtier except by royal command; his preference was to live in high estate in the west of the realm, exercising his authority as warden of the Welsh Marches. His children's marriages gave Buckingham wide connections within the nobility and made him a potentially powerful force in politics. Yet pride may have stood in the way of Edward Stafford's political influence. 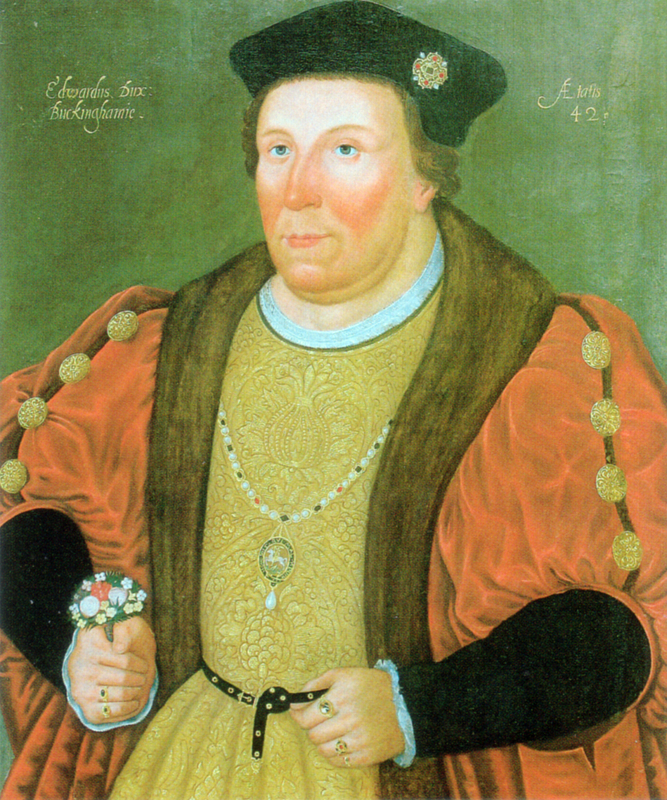 Although Buckingham appeared to be high in the favor of Henry VIII, the King was both jealous and suspicious of him because of his wealth, his lands, and his descent; on the paternal side he was a descendant of Thomas of Woodstock, son of Edward III, and his mother was a sister of Edward IV’s Queen. The real power in Henry VIII's court was not with the great nobles but with low-born men such as Thomas Wolsey. Stafford, with his royal blood and numerous connections by descent or marriage with the rest of the aristocracy, became a leader of the disaffected nobles excluded from high offices. Although his title and ancestry were sufficient to arouse Henry's suspicions, Buckingham increased his danger by displaying an inordinate pride in both. In 1519, the duke's servant, Sir William Bulmer, was prosecuted for wearing Buckingham's livery in the king's presence, and in 1520, the Duke alarmed Henry by requesting permission to maintain order along the Welsh border by arming ducal retainers. Buckingham along with other nobility had grown to resent Henry VIII’s advisor. Wolsey was ‘low born’ and some of the nobility resented his influence with the King. In late 1520, Wolsey received an anonymous letter accusing the Duke of treason, Henry took the charge seriously. Wolsey’s supporters had Buckingham tried for treason. The charges were listening to prophesies of the King’s death and of his succession to the crown and that he had expressed an intention to kill Henry VIII. Arrested in Apr 1521, Stafford was tried at Westminster on 13 May, before a panel of 17 peers, but with the king's mind already decided, convinction was certain. Even though the treason statute then in effect required overt acts for conviction, Buckingham was found guilty only of treasonous speech. Despite a plea for mercy from Queen Catalina of Aragon, he was executed at Tower Hill on 17 May 1521. His body was buried in the church of The Austin Friars. He was attainted by act of Parliament on 31 Jul 1523. On Friday 17 May at about eleven o’clock the Duke was delivered by the Sheriffs of London, John Kyeme and John Skevyngton, to the scaffold at Tower Hill where he was beheaded. All his land and estates became forfeit to the Crown. Holy Roman Emperor, Carlos V, King of Spain, hearing of the fall of the Duke, exclaimed, in allusion to Cardinal Wolsey, “A butcher's dog has killed the finest Buck in England”.